This is an excellent compilation of Brahms chamber works. In particular, the opus 111 quintet is easily among the finest of his chamber pieces, a personal favorite, and one of his last planned works, before he met with the clarinet. After that he produced four noted works for that piece, the longest and most prominent being the clarinet quintet itself, and presented here. The two works flow together very well, almost as if they were one composition. On a negative note, I believe the performance of the opus 111 quintet was very slightly jumbled, yet still good (though this is perhaps a difficult piece to be precise with), however, the opus 115 Clarinet Quintet was performed near flawlessly. The price here is excellent, and as an introduction to Brahms Chamber works, and his sunny, warmhearted genius, one can do no better. The other pieces Brahms would do for the clarinet, btw, the Trio (opus 114), and the 2 Clarinet Sonatas (opus 120), are wonderful, moody works in themselves, and not to be missed by those who value his chamber work. Nonetheless, this is an excellent disc to start. Having accumulated a half-dozen performances of Johannes Brahms’ String Quintet Op. 111 (1890) over the years, this version by the Melos Quartet looks to me like the best of them. I think it qualifies as an honest-to-god great interpretation. Note that this review covers the Op. 111 Quintet only – I haven’t heard the Clarinet Quintet and so am not commenting on that performance. The Melos’ version of the Op. 111 shows a tremendous sense of ensemble and unity. You often hear about groups of musicians playing as one; this interpretation is a shining example of that. The five players’ ensemble isn’t just polished and precise – the interpretation and vision is shared and unified. There are also some unusual touches. The nervous, angst-filled Adagio is taken unusually slowly, which I at first thought was a mistake -- but the blazing conclusion of this movement is proof that the Melos knew exactly what they were doing. The coda of the opening Allegro non troppo is also notably well-played, with fluidity and momentum. I also particularly liked the way the Melos handled the section of the development section which reharmonizes the forceful opening melody in median relationships (mm. 79ff), a section that can get clotted and clunky, but is done beautifully here. 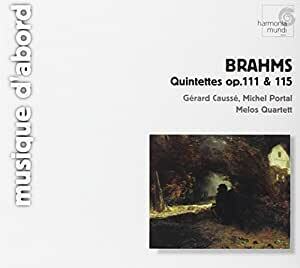 This Quintet is difficult to bring off, but the Melos show both a deep knowledge of the piece, technical chops and a vision of what the music means. Sound quality is very good. I haven’t heard every Op. 111 out there but have a decent sample size under my belt and this looks right now like the definitive recording.